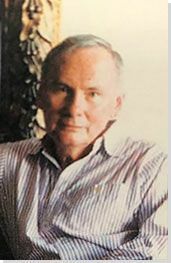 The below artworks are the most important by Richard Estes - that both overview the major creative periods, and highlight the greatest achievements by the artist. Artwork description & Analysis: Estes considers this piece, which depicts a young man curiously peering out of the window of a Greyhound bus, to be his first mature painting. His work from the late 1950s and early 1960s had been an experiment in looser brushwork - something along the lines of the Realist paintings of the mid-19th century. He abandoned that style for his trademark hyper-realistic paintings in which paint is applied carefully and brushwork deemphasized to the point of being invisible - almost a photograph. At first glance, it is easy to understand why his paintings can be confused with a photograph: the reflective qualities of the car hood and windshield, and the sheen of the metal paneling on the bus, seem almost too true to life to have been painted. These "vehicle-reflection paintings" were the first successful series for Estes, who worked on them between 1966 to '69. These paintings are also evidence of the artist taking on abstraction. Using distorted light and reflections, some of these paintings are almost hard to discern. As the art historian John Perreault wrote: "in [some of] these paintings there are small patches of unreflected "reality" that anchor the images in recognizable space. These slivers of relatively undistorted space are more than ingenious; they allow the viewer to get his or her bearings." The American modernists of the 1920s and 1930s had been powerfully moved by the monumental architecture of New York landmarks, translating it into their art with an almost religious reverence. In contrast, Estes tends to avoid postcard views of landmark sites in his paintings, preferring instead to depict the city in the way its inhabitants experienced it, while preoccupied with the demands of everyday life. Here, the iconic Flatiron Building is barely recognizable in the car's rear window. Instead of standing vertically, it appears sideways, as a warped and distorted reflection. The focus of the work thus seems to be the state of mind of the lone passenger of the bus that may similarly not appreciate the iconic value of New York landmarks. Artwork description & Analysis: While in many of Estes' earlier urban paintings, cities are often deserted, here the Telephone Booths are occupied. If not for the figures in the phone booths, whose bodies create a kind of middle ground in the painting, the work would potentially devolve into further abstraction controlled largely by the strong geometric components like the frames and doors of the booths. Still, the reflections of fragments of the city - from passing taxis and strolling pedestrians to shop signs - seem to compete for space in the ambiguous depth of the composition. The result is a very confusing image that seems to be flat and yet shifts back and forth between shallowness and depth constantly. In other works by Estes that include figures, the humans are much more sharply defined in contrast to shifting, fragmented, and sometimes dissolving forms of his complicated paintings; in contrast, the figures in this work are partial to the point of being simply abstracted forms juxtaposed with other forms. 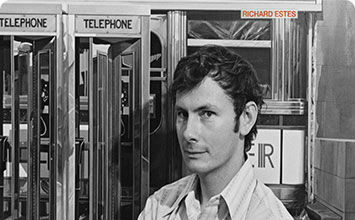 The irony of the alienation and isolation of the urban experience seen in other works by Estes that include human figures is, in a way, heightened here as the occupants of the phone booths are barely distinguishable to the point of nearly disappearing. 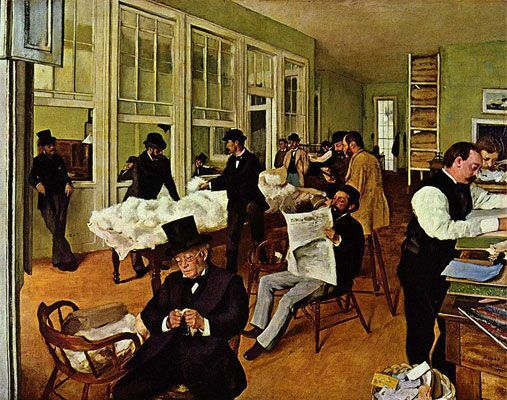 John Updike wrote an essay on the painting in which he reflected, "By the etiquette of metropolitan crowding their persons have been reduced to mere signifiers that the booths are taken; like computer bytes or slugs of type, they fill their slots and give the information. The bleakness of this information contrasted with the richness or the visual information the painter has unstintingly imparted, makes for an utterly tender artistic irony." The image recalls the closed off, claustrophobic rendition of metropolitan life of George Tooker's Subway (1950), although it articulates that post-war anxiety in a much more matter-of-fact and accepting manner. Artwork description & Analysis: Double Self-Portrait is an unconventional self-portrait. At first glance, Estes seems not to be the primary focus of the piece. We first observe him slightly to the right and below the center of the canvas. He is standing outside on the sidewalk in front of a diner with a camera mounted on a tripod. His hands are on his hips, and he is dressed casually in jeans and a short-sleeved shirt. His reflection appears alongside the slender white frame at the center of the large windows at the front. His reflection is bisected at the waist by a looping yellow linoleum counter that wraps around the front windows and the food preparation area at the center of the space. Estes's 'double' is easy to miss as it is very small and there is so much other 'noise' on the canvas. But the second Estes is actually directly in the center of the canvas, in a mirror at the rear of the restaurant. He is only visible from the waist up. The scene appears to be set before the diner has opened, in the early morning. This pristine, untouched storefront brings to mind Edward Hopper's Early Sunday Morning (1930) and Estes' reflections do little to mitigate the sense of urban bleakness that seems to update the earlier classic painting. This painting emphasizes the interplay between line, light, and reflection on different types of surface, rather than revealing information about the artist's inner life. Estes preferred to let his painting speak for itself, allowing the viewer to attribute their own meaning and interpretation. He observed, "The great artists of the past never let their feelings or personalities intrude that much. What they were really like doesn't come out in the work. What kind of man was Shakespeare, or Beethoven, or even Rembrandt? There's every point of view except his own, really." Indeed, we don't learn much about Estes and his practice here and the piece unsettles the expectations created by the title through playful concealment. Artwork description & Analysis: Estes' signature splitting of a single image is apparent in this painting in which the interior of the ubiquitous Murano glass shop provides a shallow, largely flat contrast to the layers of reflection in the large glass storefront. His many "storefront paintings" are most certainly inspired by the photographer Eugene Atget's window displays (and reflections) from the 1920s. Here, the wares of the shop surely compete with the glorious views of the city of Venice. Interestingly, this view (and many others the artist composes) are logistically impossible. This storefront and window stands today and a visitor to the site can see the discrepancies. The view reflected of the magnificent palazzo on the Grand Canal is impossible to see at such a scale, while, to the right, the famous Rialto Bridge would also not be reflected in the storefront at that angle. This scene reveals Estes' method of creating a composition by combining multiple images into a single painting. The artist himself cleverly commented on the subject: "It's not art because I change things. It's not about the changes. You don't make changes in order to make changes: you make changes in order to make it closer to what it really is. The only reason I change things is simply to make what is really happening clearer. And then you change things for composition." Artwork description & Analysis: Though Estes moved to an apartment and studio space near Central Park West in 1971, he began incorporating New York's iconic green space into his painting only in 1987. He took the title from the composer Stephen Sondheim's Sunday in the Park with George (1984), a musical inspired by Georges Seurat's Pointillist masterwork, A Sunday Afternoon on the Island of La Grande Jatte (1884 - 86). Estes knew the painting well, having developed an affinity for it during his years at the Art Institute of Chicago. Using a very modern approach, Estes quite clearly references the tradition and history of European representational painting with this work. Like Seurat, Estes is attentive to the light and the way it reflects on the surface of the water as well as the eclectic assembly of moods and postures of the people relaxing in the outdoor space. Yet, despite Estes's impeccably accurate rendering, finer details such as trees, rocks, clusters of grass, and the falling of shadow, this is in many ways an idealized image. 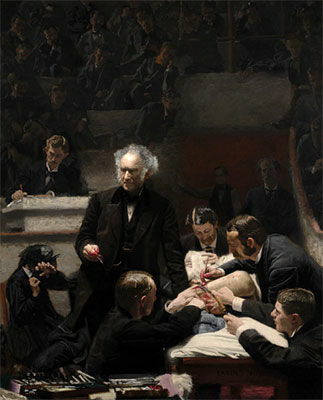 Artwork description & Analysis: The Plaza, as with many of Estes' works, reads, like a conventional two-part painting or diptych. It represents two radically different environments: the enclosed, protected space of a city bus and the open, busy vehicle and pedestrian space near the famous Plaza Hotel at the southern end of Central Park. The view on the right side of the picture offers a slightly distorted view of this particular area of New York City. The street appears wider than it is in reality and juts off at a diagonal near the hotel. Meanwhile, the structure of the bus is strange: it seems to widen very radically toward the foreground, as though there is a bend in the midsection of the vehicle. It literally opens up to admit the viewer into the interior. While the human figures on the street corner engage with one another, those in the bus, despite sitting within close range of each other, do not interact. It is almost as if they are watching a performance of city life at a remove that is emblematic of Estes' existentialist presentation of contemporary urban life. The particular brand of estrangement of the city dweller (inside the bus) is juxtaposed with the active exploration of the urban setting of what the viewer might presume are tourists (outside the bus). Artwork description & Analysis: In this portrait, I.M. Pei is seen in the far left middle ground, resting his arm on a railing, creating a line that draws one's eye directly to his figure. Behind him, Estes shifts the visual plane entirely, modeling the architecture of Pei's building interior, and showcases rows of exposed floors that all get cut off by a structural grey brick wall that spans the building. Then, the vantage point shifts again, showing a brightly lit six-story library. As the viewer's eye is guided across the composition with linear cues, modeling the masterful architecture of the building, the far right section of the painting boasts the grid-like set of windows with a view that places the Capitol Building plainly in sight. Pei and the Capitol building are on opposite sides of the expansive atrium, which claims a considerable portion of the painting and dwarfs Pei. In a sense, the renowned architect's work functions as a portrait as much or, arguably even more so, than his diminutive physical representation. Estes' choice to include the U. S. Capitol building - smaller, and thus in a sort of chronological distance as well - alongside Pei's work, situates the latter within a larger, historical architectural lineage. Artwork description & Analysis: Water Taxi, Mount Desert takes inspiration from the people and landscapes of Mount Desert Island, Maine, where Estes has owned a home since the early 1970s. It depicts fellow painter, Nancy McCormick, and her daughter, Nina, riding in the back of a water taxi as it carries them to Northeast Harbor. They seemingly have the entire craft - and the spectacular view - to themselves. Estes expertly renders the wicker furniture and plastic windbreak and also manages to capture people moving from one world to another - from so-called civilization to the quiet of the island. Nancy and Nina watch the sea and land sweep by with keen attention, and the viewer is drawn into the flux of transition and movement. Estes paints from roughly elbow height, allowing us to see the wake rippling out behind the vessel as it makes its crossing. His studies of bridges from the 1980s culminated in more detailed examinations of waterscapes in the 1990s. However, both his early and late work blurs distinctions between painting and photography, with a focus on the intersections between the natural and manmade worlds that calls attention to the unexpected beauty, which constantly surrounds everyday scenes and small moments. In general, Estes has tended to focus on landscapes rather than portraiture. He has once remarked "What was in the background just seemed more fascinating than the figures." Artwork description & Analysis: Estes's first trip to the Antarctic in 2007 inspired a series of twelve paintings of the world's most sparsely inhabited continent. It is difficult to imagine a setting further away from New York City. Like many visitors to Antarctica, he saw the continent from a cruise ship. Although inclement weather prevented him from leaving the boat during this first trip, he returned in 2011 and was able to make excursions on-shore. Through his meticulous recreation of the frozen mountains, steely gray sea, and darkening sky Estes makes the viewer keenly aware of the turbulent, freezing conditions. The forbidding monochromatic vista that dominates the canvas calls to mind Ansel Adams's iconic black-and-white photographs of the High Sierra, yet Estes reminds us of the presence of humanity by including a partial view of a ship on the extreme right side of the canvas. The warm tones of blue in the ship's wake and the reddish-brown wood of the railings make for a striking contrast to the rest of the composition. Yet, shunted to the side, the ship is rendered small and unimpressive in comparison with the dramatic natural scenery. First published on 19 Nov 2016. Updated and modified regularly.